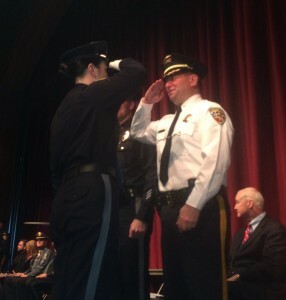 Monmouth County: Sheriff Shaun Golden is pleased to announce the graduation of 68 newly sworn in law enforcement officers from the Monmouth County Police Academy. On Dec. 17 recruits from the 89th Basic Course for Police Officers received their police training commission certifications during a ceremony at Neptune High School’s Performing Arts Center. The Basic Course for Police Officers is a 20 week program with 780 hours of training. The class is run through the Monmouth County Police Academy and upon completion the officers are well trained and well prepared to serve their respective law enforcement agencies. Sheriff Shaun Golden, Chief John Sorrentino, Sea Bright, Chief Edward Kerr, Spring Lake and Acting Prosecutor Christopher Gramiccioni presented the graduates with their certificates.